TARTAN: Referendum and Uni wardrobe. 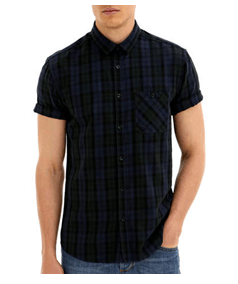 TARTAN: The Scottish Referendum and your back to Uni wardrobe ready for Autumn/Winter '14. The results for the Referendum for Scottish Independence are out and the media coverage on the topic is unrelenting. Scots are excited and apprehensive for the results that could change their lives forever. So in an attempt to remain culturally relevant, I thought I’d stick with the theme of Scottish National Identity. I will therefore discuss the enduring romance between Catwalk and tartan. As a student living in Edinburgh, working just off Princes Street, I’m subjected to my fair share of tourist aimed novelty shops… Stocked solely of plaid patterned merchandise. I endure the blasting of obnoxious droning bagpipes from these shops’ interiors on a daily basis. It’s easy to overlook the appearance of tartan in the windows of Princes Street’s high-street stores. This being a result of an immunity developing of all things considered to be a part of Scottish National Identity! However, on returning home for the short and infrequent periods that I do in fact return to my roots, tartan patterns are more easily noticed. The familiar no-longer-foreign-in-appearance bank notes and the unfamiliar sound of silence are obvious reminders of where I am. I.e. not Scotland – and that therefore, there should be nothing that screams ‘SCOTTISH!’ in my immediate presence. But that presumption is always wrong. Tartan always makes an appearance as the Autumn/Winter collections hit the high-street and there may be two main reasons why. Firstly, tartan was historically made from wool and so obviously, it’s often associated with its benefits of being a warm material. Secondly, many designers remain loyal to plaid. And high-street stores take their inspiration straight from the catwalk. Although the majority of collections show new and modern twists to the classic print, playing with colours and mixing prints, we can almost guarantee that tartan will play its part in designers’ A/W collections. Recently, Vivienne Westwood ‘joined the Hall of Fame at the Scottish Fashion Awards thanks to her loyalty to tartan textiles’, Tessa Hartmann founder of the Scottish Fashion Awards explained to The Independent. ‘[She] has done more for Scottish Textiles than probably any other designer of her generation. Her brand name is synonymous with the tartan pattern and her fascination for this iconic fabric is unrelenting’. So, given all of the recent Scottish oriented hype, where can a poor-old-Student find their own back to Uni pieces of plaid? 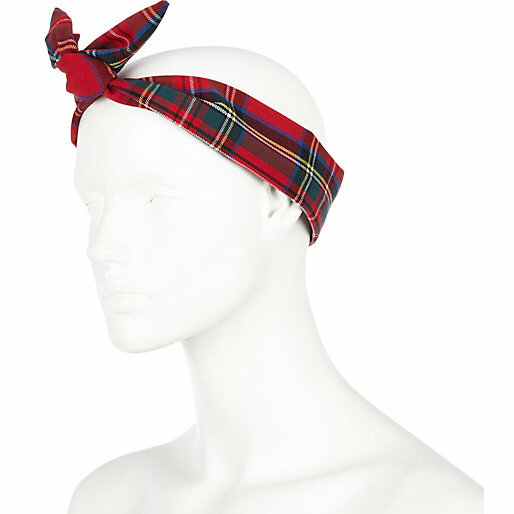 This traditional red tartan wire wrap headband is perfect for those roll-out-of-bed-late-with-a-wee-dram-of-a-hangover mornings! If you don’t leave NOW you’ll be late! Just throw this headband on, and not only will the attention be drawn away from your unwashed hair, it will look utterly fabulous! 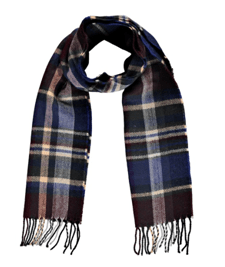 This tartan-tastic winter scarf is perfect for those daily walks to early morning lectures. Available in three different colours and types of tartan, you’re sure to find the check for you! 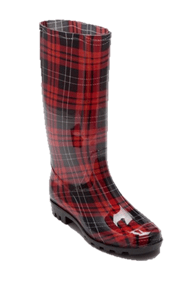 Why not invest in these calf high welly boot? You can get to your lectures nice and dry at the same time as looking pretty in plaid! And for a unisex beaut what about this deep blue tartan piece? It’s stylish, timeless and at a bargain price in the sale! So hurry – you don’t want to miss out! Pair it with a pair of skinny or boyfriend jeans and you’ll be good to go. Burton, WAS £20 – NOW £12. TIP: Don’t forget that although River Island doesn’t usually offer student discount, they often have events at the beginning of term aimed at students. These events tend to offer around 20% Student Discount, so if you find a tartan piece you simply love be sure to hold on a few weeks! Also, why not check out Depop, my current love affair? It’s the student friendly solution for fashion savvy shopaholics like me. The App provides oppor the opportunity to swap items, buy brand new items at bargain prices and to find pre-loved items that need a new loving home, there’s no need to go over budget whilst looking for those back to Uni necessities with this App!